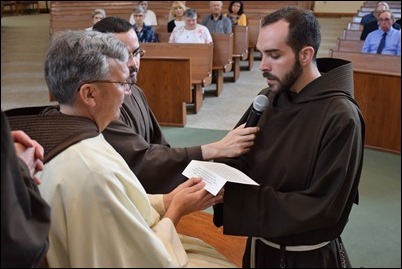 This week we were happy to announce the appointment of our new judicial vicar for the Archdiocese of Boston, Father Jonathan DeFelice, OSB. He will begin in his new position in September. 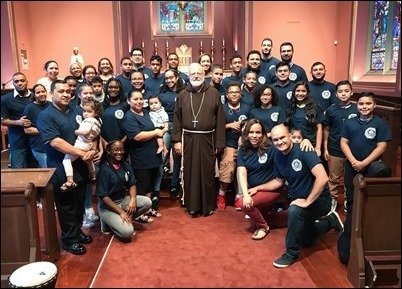 We are very grateful for Father Jonathan’s willingness to serve with us, and also very grateful to his community at St. Anselm’s for making him available to come help us. 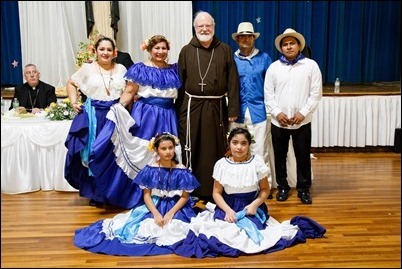 Father Jonathan is the president emeritus of St. Anselm’s College in New Hampshire. 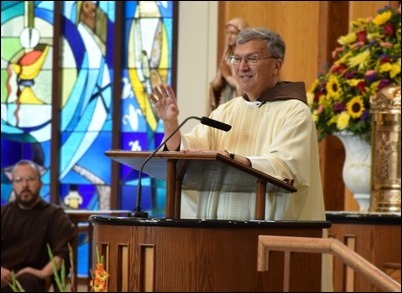 He retired from the college in 2013 and, since 2015, he has been working at the Diocese of Providence, as Assistant Moderator of the Curia and Vice Chancellor as well as serving on the tribunal of the diocese. 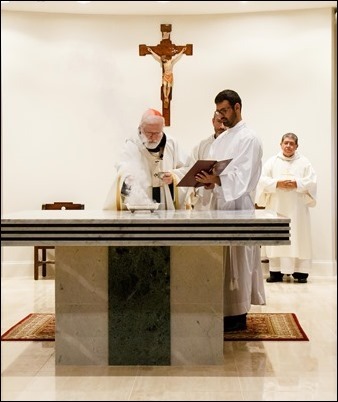 I had a chance to meet him earlier this year when I gave the commencement address at St. Anselm’s. 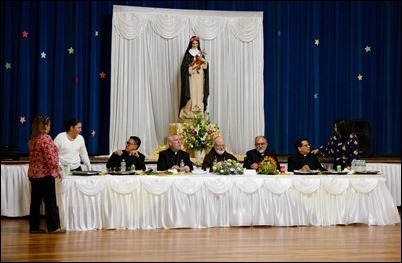 We had lunch together, along with Abbot Mark Cooper. At that time, I learned about his availability and was happy to invite him to come to Boston to work with us. 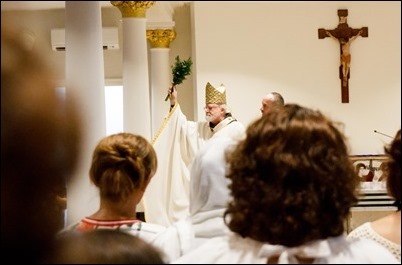 He will be taking over for Bishop Mark O’Connell, who has served as our Judicial Vicar since 2007. 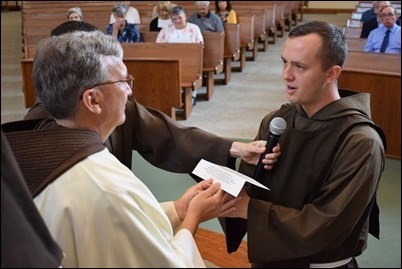 Since he was made a bishop in 2016, Bishop Mark has had many additional responsibilities, so we are grateful for Father Jonathan willingness to step in. 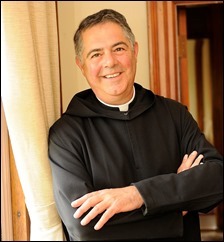 We want to say how happy we are to welcome him aboard and how wonderful it will be to have a Benedictine in our midst! 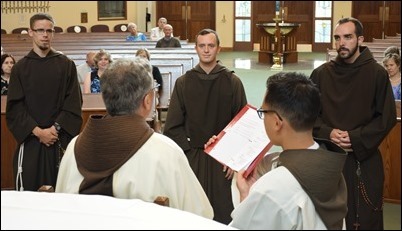 During the summer is when my Capuchin community holds their vows ceremonies and so on Saturday I was in Pittsburgh to be present for the profession of simple vows of three young Capuchins: Brothers Paul Rahn, Collin Kourtz and Michael Herlihey. 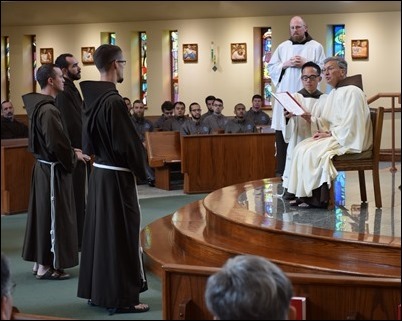 After one year of novitiate they take these simple (or temporary) vows, and then after three years they take solemn vows. 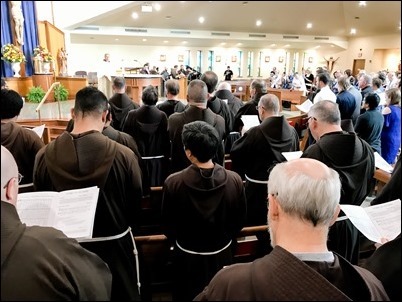 When they entered the novitiate, they were given the habit of probation, which includes a bib-like scapular that we call the caparone. 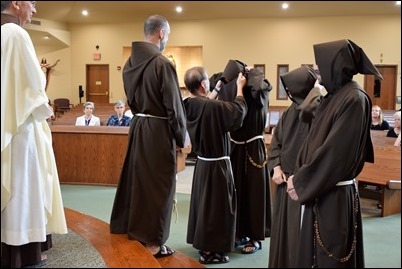 Having taken their first vows, that scapular is removed and they wear the habit of a professed friar. 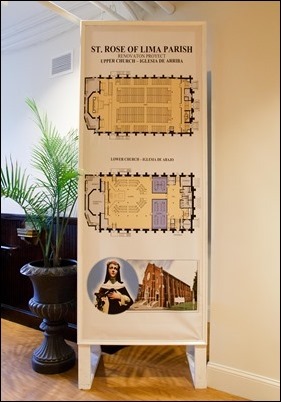 The profession was held at the parish of St. Catherine of Sweden, near our Monastery of St. Conrad. 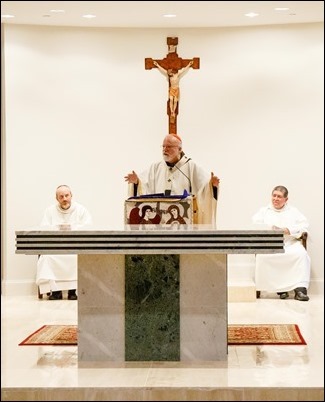 For the ceremony, they brought the crucifix of the Novitiate of St. Conrad, which was in the novitiate when I was there. 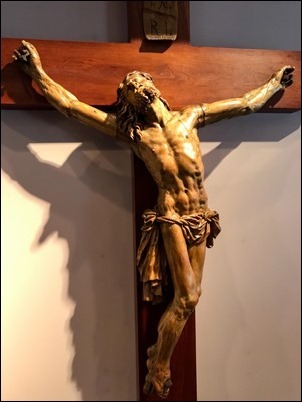 It is a centuries-old crucifix from Bavaria that has a great deal of historical and sentimental meaning for the friars of my province. 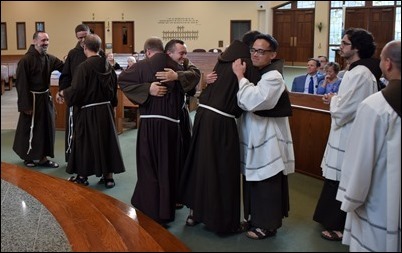 I always enjoy being with the friars at the profession ceremony. 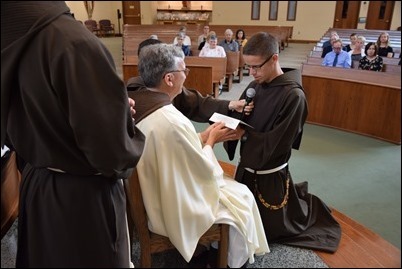 It is a time for all of us to renew our own vows and commitments as we witness the generosity of these young men who are giving themselves to God in consecrated life. 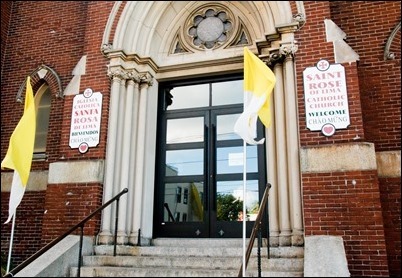 Sunday, I was back in Boston and I celebrated the Spanish Mass at the Cathedral. 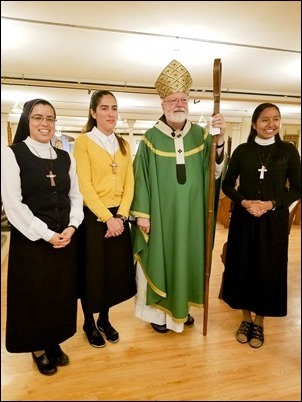 There, I had an opportunity to meet the two new postulants who are working with Sister Petra, one of our pastoral ministers at the cathedral working with the Hispanic community. 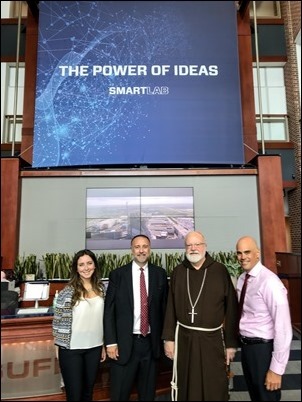 Also on Monday, I met with the youth group of the cathedral to give them my blessing as they were leaving to go on a pilgrimage to the National Shrine in Washington D.C.
On Tuesday, I was invited to visit the new headquarters of the Suffolk Construction. There, we heard a very interesting presentation on the ongoing work at the cathedral and were able to meet a number of the people on the staff. It was fascinating to see the extraordinary technology that they have at their disposal for these kinds of projects. We are exceptionally grateful to John Fish and Suffolk Construction, who are donating so much of their time and talent to this important work of the cathedral renovation. 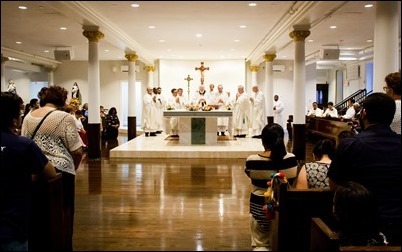 That evening, I went to St. Rose of Lima Parish in Chelsea to celebrate the dedication of the altar of their newly refurbished lower church. 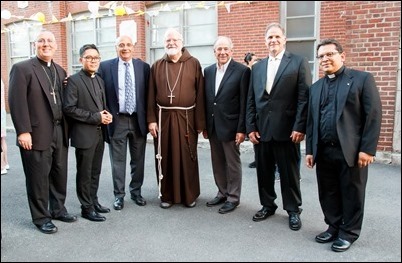 With us for the celebration were North Region Bishop Mark O’Connell, Superintendent of Schools Kathy Mears and a number of priests and seminarians. The altar and the renovations they did in the lower church are quite impressive. 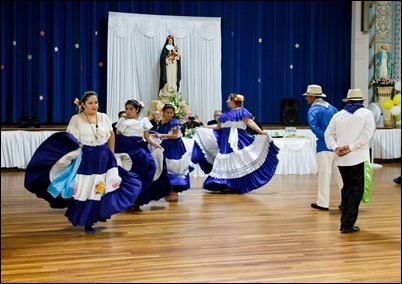 It was a very joyful celebration for the parish and the whole community was very enthused. 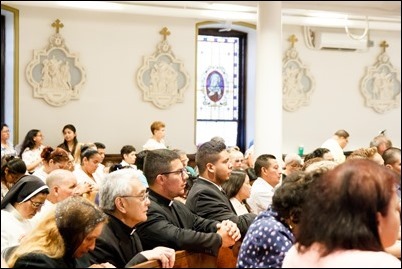 There were a large number of people there, particularly from the Hispanic and Vietnamese communities. In fact, they told us that they decided to have the dedication during the week because they knew they would never be able to accommodate the crowd if it was held on a Sunday. As it was, there was standing-room only! 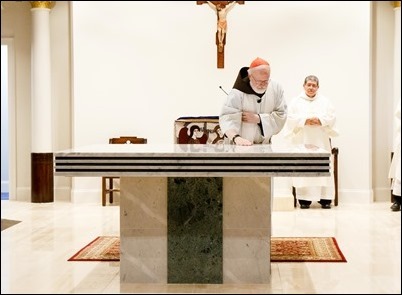 The celebration of the dedication of an altar is always so beautiful. 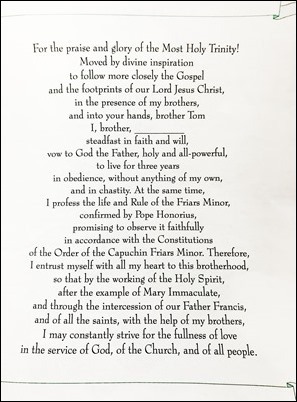 The prayers are so meaningful and scriptural. 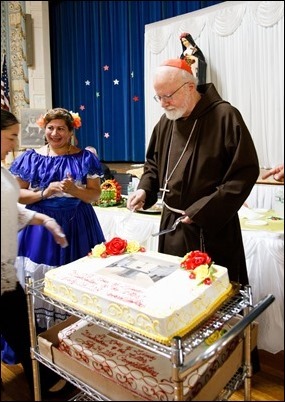 It was a beautiful celebration and, afterwards, there was a big celebration for the whole parish, complete with a cake and folk dancing. 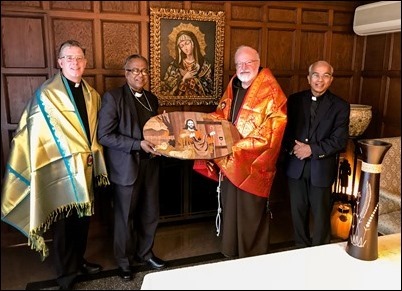 On Wednesday, I was visited by Bishop Antonisamy Francis of the Diocese of Kumbakonam in India who was accompanied by his director of missions, Father Selva Raj. He brought us some lovely gifts, including an Indian shawl of welcome, a painting of Christ the Good Shepherd and a handmade Indian vase. He is in the area conducting mission appeals, so he came to greet me. He also wanted to speak to me about sending a priest to Boston, so we asked Father Robert Blaney to join us, as well.